I feel all your troubles, as if they were my own. Amelie Gonzales was a little girl at our parish who taught me many things. She taught me much about both life and death. Her short life was a blessing to her family and to all those who knew her. It certainly was a blessing to me. Amelie’s mother, Amata, and her grandmother Marlene, regularly attended our Padre Pio prayer group at Our Lady of the Rosary. The family was very devout. Amelie, who followed the good example of her mother and grandmother, was a very spiritual child. Amata told me that when she took Amelie to the store each week, Amelie always wanted to buy a bouquet of roses to place in front of the statue of the Blessed Virgin Mary. Amelie was diagnosed with a rare form of lung cancer called Pluropulmonary Blastoma. It is a cancer that occurs most often in infants and children but has also been reported in adults. The doctors hoped that chemotherapy treatments would arrest the cancer. Finally, the doctors told the family that they had done everything in their power to save Amelie. They had used every modern medical means at their disposal. There was nothing more they could do. Amelie grew weaker as the cancer progressed but strangely enough, she never looked sick. She had a desire to receive Holy Communion. 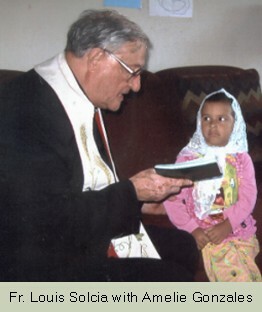 Children ordinarily do not receive their first Holy Communion before the age of seven. Amelie was just five years old. But because she had a spiritual maturity beyond her years and because of her terminal diagnosis, I was able to give her Holy Communion. Our Padre Pio prayer group had prayed for many weeks for Amelie. We all hoped in our hearts that she would be healed. But it was not to be. Amelie died peacefully in her mother’s arms on December 14, 2009. On the day that she died, she saw a white butterfly. “Mommy, don’t you see the butterfly?” she asked. But her mother could not see it. No one saw it but Amelie. After her death, Amelie truly looked like a little angel. I had a desire to visit the cemetery where Amelie was buried and I went there on several occasions to pray. Beautiful red roses in a heart-shaped pattern had been placed on her grave by her mother. In my heart, I felt a great sadness. I wondered why God had taken such a beautiful little girl and left us all with such heavy hearts. I especially felt sorry for Amelie’s family because of their grief. But then I reasoned to myself that God never allows something bad to happen unless He can draw good out of it. I have been a priest for more than fifty years and I have always believed that. But in this situation, I struggled with God. Although at the time, I could not see past the pain of the situation, soon I would see the good that God would draw out of Amelie’s death. Amelie’s best friend was her eight-year-old cousin, Alexis. The two girls were inseparable. After Amelie’s death, Alexis’ sister, Cassandra, had a vivid dream. In her dream, Amelie was looking everywhere for Alexis. “Where is Alexis?” she asked. “I want to find Alexis!” It was shortly after Cassandra’s dream that Alexis announced that she wanted to take instructions in the Catholic faith and be baptized. Everyone in the family was surprised. Alexis’ desire seemed to come out of nowhere. There was certainly no one in her family encouraging her to take that step. Alexis’ mother had no religious affiliation and she never took the family to church on Sunday. However, she was willing to let Alexis take instruction in the Catholic faith. I had the sense that the dream of Amelie was instrumental in Alexis’ desire to become a Catholic. Amelie’s mother now brings Alexis to our parish once a week. I am giving her the instructions myself and preparing her for baptism, confirmation and for her first Holy Communion. God can and does draw good out of the hard and painful situations in life. We only have to look and we will see. To everything there is a season, a time for every purpose under heaven – A time to be born, and a time to die; a time to plant, and a time to uproot … a time to break down, and a time to build up, a time to weep, and a time to laugh; a time to mourn and a time to dance; a time to cast away stones, and a time to gather stones. Melissa Finn contacted us through our website at www.saintpio.org regarding her son Joey’s remarkable story. Joey Finn of Hudson, New York had been coping with severe asthma for most of his childhood. In 2005, when Joey was ten years old, he was diagnosed with cystic fibrosis, an incurable disease that makes it difficult to breathe and eventually destroys the lungs completely. Joey’s lungs already showed the damage from the disease and he would have to have breathing treatments twice a day for the rest of his life. The median survival age for those who have the disease is in the early thirties. Shortly after Joey’s diagnosis, his mother, Melissa Finn was introduced to the Make-A-Wish Foundation. The Make-A-Wish Foundation is a nonprofit organization which offers children with chronic, life threatening diseases, the opportunity to make a wish and have it granted. For the youth who daily struggle with incurable illnesses, the chance to have a wish come true can lift their spirits and enrich their lives. It gives them something positive to look forward to in life. The Make-A-Wish Foundation, in its ministry of compassion, has brought happiness to countless children. God. 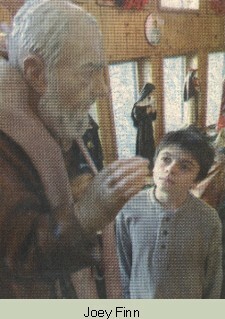 Like Joey, Padre Pio had suffered most of his life with poor health. He was afflicted with chronic breathing problems, including asthma and bronchitis. It was an acute case of asthma that was a contributing cause of Padre Pio’s death in September 1968. In thinking of her son’s wish, Melissa had one deep concern. She was afraid that Joey would be crushed if he expected a miracle from Padre Pio and did not receive one. She talked to him about it and he assured her that was not the case. He had a devotion to Padre Pio and wanted to pray at his tomb. He intended to offer up his prayers for all the people in the world who were stricken with cystic fibrosis and to pray that there would someday be a cure. He was certain that there would be no disappointment in that. 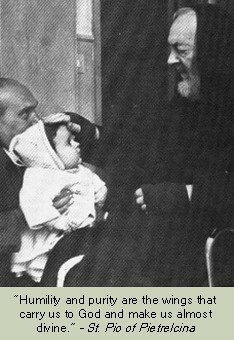 One recalls that Padre Pio felt a great call to help the sick and suffering, not only through his daily intercessory prayers but also through concrete action. He founded the Home for the Relief of Suffering for that very reason. He spoke of it as his “earthly mission.” There were many scoffers and detractors who doubted that the project could ever succeed. But against all odds, the Home grew and prospered and has helped countless lives. Joey Finn’s wish was certainly one of the most unique that had been submitted to the Make-A-Wish Foundation. Some of the popular requests included a shopping spree at the mall, an outdoor playground, and a trip to the Super Bowl. Occasionally, children requested a trip to Honolulu or Hollywood. But the request to visit San Giovanni Rotondo in southern Italy had to be a first. The Foundation checked with Joey’s mother to make sure that it was his wish and not hers. She assured them that she was just as surprised as anyone else when she found out Joey’s wish. Joey’s request was finally approved and in June 2007, twelve-year-old Joey along with his mother, father and thirteen-year-old sister made preparations to travel to Italy. Their first surprise came, shortly after they boarded the plane. The pilot came over the loud speaker and proposed a question to all the passengers. “Is it true that Joey Finn, who is sponsored by the Make-A-Wish Foundation, is on board the plane?” the pilot asked. Joey’s excitement intensified when the pilot asked him if he would like to step to the cockpit and turn the key to start the airplane. His reply was an enthusiastic, “Yes!” It was the beginning of an extraordinary journey for the entire Finn family. The first stop on their remarkable pilgrimage was to Rome, where they toured the Vatican. They spent time at the beautiful Sistine Chapel, St. Peter’s Basilica, the Catacombs, the Holy Stairs and more. Along with a multitude of others, they were able to see the Holy Father and to receive his papal blessing. Joey took many excellent pictures of the Holy Father. In San Giovanni Rotondo, the pilgrims who were waiting in line to make a visit to Padre Pio’s tomb, prayed the Rosary while they waited. Joey and his family joined in the prayers. They literally just squeezed into the church as it was closing that evening. Melissa was the very last person allowed to enter before the doors were locked. Padre Pio’s tomb was below the main altar of the church and was surrounded by an iron enclosure. People were able to draw very close to the tomb but the iron enclosure prevented anyone from actually touching it. On the evening of the Finns’ visit, the little iron gate was unlocked and opened. All those who were present that evening were allowed to place their hand on Padre Pio’s tomb. Melissa Finn was later told that the iron gate is customarily closed and locked at all times. The Finn family never imagined the impact the trip to San Giovanni Rotondo would have on their lives. Melissa Finn felt compelled to go to confession while visiting the monastery church of Our Lady of Grace. She had not been to confession in more than twenty-five years. Joey told his mother that when he stood and prayed at Padre Pio’s tomb, he had the sense that Padre Pio had heard his prayers. “Padre Pio has taken our family in as his own,” Joey said to his mother. For the Finns, the time spent at Padre Pio’s monastery was a time of spiritual renewal and positive change. After returning home, they began to attend Mass together every Sunday as a family. It was something they had not done for a long time. Joey had a desire to learn more about his Catholic faith and to serve the Church. He soon became an altar server each Sunday at Mass. Joey had been able to purchase some very meaningful souvenirs of Padre Pio while in Italy. Back in Hudson, New York, he set up his own little shrine dedicated to his patron saint and placed it on display in his home. Quite unexpectedly, he even received a third class relic of the saint. A nurse who had heard about Joey was touched by his story. She sent him a very special gift. It was a Rosary which had been blessed by Padre Pio. One of her elderly patients had given it to her. “I believe that Joey found something in Italy which is of equal value to finding a cure for his disease,” Melissa Finn said. “He found his faith, the strength that he will need in his lifetime to endure the challenges that lie ahead of him. He prayed, he listened, he learned … He did this of his own free will and with great determination.” In the final analysis, the greatest healings of all are those that take place in the human soul. We had several extended telephone interviews with Judy Hayes. She is a woman of great faith and inspiration. multitude of tests. The results were not good. Judy was diagnosed with Hodgkin Lymphoma in stage four, the final stage. The cancer had already spread to her bones. Before her first chemotherapy treatment, Judy went to a Catholic Gift Shop. She wanted to get some prayer and novena cards of her favorite saints. She was nervous about receiving chemotherapy and planned to pray throughout the treatment. The chemotherapy and radiation treatments made Judy very ill. In December, she came down with pneumonia and had to be admitted to the hospital. She became weaker by the day. She lost the ability to walk. Her condition seemed to go from bad to worse. She developed dangerous blood clots and had to be treated for congestive heart failure. She was in and out of the intensive care unit. She had to go into surgery to have her gall bladder removed. Finally, after many months in the hospital, she was sent to a nursing home. However, she soon developed an infection and had to be readmitted to the hospital. But her condition did not improve. She was placed on a ventilator for nine days. She drifted in and out of consciousness, barely holding on to life. Through the long days and nights, she petitioned Padre Pio to help her. She prayed to him, dialogued with him, entreated him, begged him. For some reason, it was Padre Pio that she addressed her urgent prayers to rather than to the saints that she had been devoted to for years. One particularly day, as Judy lay silent and immobile in her hospital bed, she heard the nurse supervisor talking to some of the other medical staff. “Before you leave your shift tonight, prepare Judy Hayes’ death certificate,” the nurse supervisor said. “Make sure you have the doctor sign it before he goes home. I have been observing her throughout the day. She is going to die tonight.” Judy was devastated by the words. Everything within her cried out against it. She didn’t want to die. She couldn’t die! She begged Padre Pio to help her. People everywhere were praying for Judy Hayes. One of her dear friends, who was in a nursing home, prayed a Rosary for Judy every morning at 2:00 a.m. To the amazement of everyone, Judy’s strength slowly returned. She was eventually discharged from the hospital and was able to return to her home. After Judy’s recovery, she had a great desire to promote Padre Pio. She was convinced that she was alive and well because of his intercession. She made it a habit to keep Padre Pio prayer cards in her purse at all times and she found many opportunities to give them to others. People were inspired by her faith and trust in God. Many people were helped, just by meeting Judy. One afternoon when Judy was enjoying an afternoon out in the Florida sunshine, she happened to see a woman that she felt urged to speak to. The woman was a complete stranger to her. Not knowing what possessed her, Judy went up to the woman and asked her if she was a Catholic. Judy was not in the habit of asking people their religious affiliation, especially not a perfect stranger. It simply did not seem like an appropriate thing to do. The woman however, did not mind the question at all, and answered in the affirmative. Judy then gave her a Padre Pio prayer card. She told her a little bit about Padre Pio and showed her the beautiful prayer on the back of the card. “Oh, you are an answer to my prayers!” the woman said to Judy. She then went on to explain her situation. For weeks, the woman had been taking care of her dear husband who had a terminal illness. She had become very depressed as she watched him slowly dying. She had not wanted to leave her husband that day but she had done so at the insistence of a friend. Her friend was adamant that she take a needed break. Her friend was taking care of her husband in her place that afternoon. The woman explained that she had been praying when Judy came up and spoke to her. “Oh God,” she prayed, “Please send me a sign of hope. I need greater faith in You and I need strength to go on. I am so depressed. Please send me someone who will help me!” With her eyes brimming with tears, the woman thanked Judy for the holy card of Padre Pio and assured her that she would pray to him. Our friend, Marsha Jacques of San Diego County sent us this remarkable testimony. Marsha Jacques felt very fortunate to possess four shirts which were blessed with a first class relic of Padre Pio. The shirts had also been blessed by a holy priest. Marsha decided to give one of the shirts to her neighbor, Julie Bouldin. Julie suffered from chronic pain and many serious health issues. Julie, who had a devotion to Padre Pio, was very happy to receive the shirt. Julie was not the only person in her family who could benefit from the relic of a saint. At that time, her brother-in-law, Jim, was in critical condition at the hospital. Jim had suffered a massive heart attack not long before which required quadruple bypass surgery. He made it through the surgery but soon after, he developed pneumonia. His condition deteriorated and his bodily organs began to shut down. He finally had to be placed on life support. The days passed but there was no change, no improvement in Jim’s condition. He was in a deeply unconscious state and machines were now keeping his body alive. After some time on life support, the doctor told Jim’s wife, Mercy, that Jim was not going to recover. It was just a matter of time. He said that it was time to talk about the idea of discontinuing the life support. Mercy was in a great state of distress when she called Julie, her sister, to tell her the news. Julie advised Mercy not to make any quick decisions. It was almost Christmas. It would be too hard to even think of removing the life support at Christmas time. She advised her to wait until after the holidays to consider it. Julie wanted to bring the shirt blessed by the relic of Padre Pio to the hospital and pray for Jim. Mercy thought it was a wonderful idea. Jim was not a person of faith. He was an atheist. Although he did not believe in the power of prayer, his wife and his sister-in-law certainly did.In the Intensive Care Unit, Julie and Mercy placed the blessed shirt over Jim. They prayed the Novena to the Sacred Heart for him and put their complete trust in God. Jim remained completely still and unresponsive. The next day, when they returned to the hospital, his condition was the same. But on the third day, there was a change. When they went into his room, Jim’s eyes were open. He seemed to be trying to communicate with them but he was not able to since there was a large tube down his throat. Mercy told him that they were praying the Novena to the Sacred Heart of Jesus for him. She spoke to him of Padre Pio and told him about the relic that they had placed on his chest. She asked him if it was all right with him if they continued the prayers for his healing. Through the expression in his eyes, it seemed as though Jim was trying to tell them that he was glad they were praying and wanted them to continue. Each day of the novena, Jim became a little more aware, a little more conscious of his surroundings. The doctor was incredulous at his improvement. “Even if he lives, he will be permanently disabled,” the doctor told Mercy. “He will have to spend a long time in a nursing home, relearning motor skills. He will never be able to work again.” But Mercy was not concerned about that. Her husband was now slowly recuperating. Her prayers and her sister’s prayers to the Sacred Heart of Jesus had been answered. Jim was discharged to a nursing home where he received physical therapy and continued to improve. He insisted that the blessed shirt remain with him at all times. He was either wearing it or had it right beside his bed. His atheistic beliefs are now a thing of the past. He was eventually able to return to his full time job. Jim is convinced that he has been given a second chance at life through the prayers of his family.